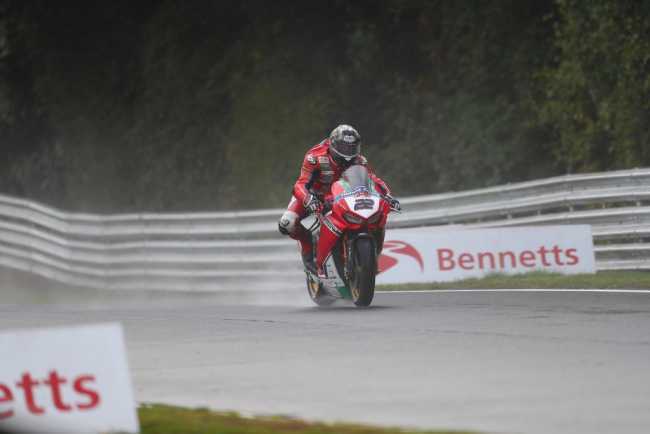 Today’s British Superbike round at Oulton Park saw the best of the British weather throw everything at the Cheshire venue, and despite podium-pace, Honda Racing were ultimately left wanting. After morning rain, race one today was fully wet with the spray from the pack on the opening laps adding to the challenge of the treacherous conditions. Starting from 10th, Jason made a fantastic start on the Honda CBR1000RR Fireblade to leap into fourth on the opening lap. On lap two he lined up Bradley Ray for third, and set about extending a gap of 6.5seconds behind him. As the chasing pack closed in the final laps, Jason fought valiantly to keep them at bay but as Haslam, then Irwin, then Laverty passed him, the #22 crossed the line 6th overall, just 1.2seconds from fourth. Dan Linfoot made steady progress in the midst of the pack from 14th up to 10th, battling both the conditions and the spray. By race two, the conditions had improved and the track was predominantly dry, with damp patches only off-line. Jason again made a blistering start to launch himself from 6th to second into the first corner, and then ensued a five-bike battle for the final two steps of the podium. Matching the front-running pace, Jason dug deep to try and haul himself and his Fireblade into a podium position again until lap 12 when he ran slightly wide into turn one and folded the front, ending his race from 4th position. In the midst of the pack, Dan also fought hard for position to bring his #4 Fireblade home in 11th. Conditions were really mixed this weekend and the weather threw everything at us. I made good starts in both races and it was good to be running at the front. On the first lap of race one, normally I'm one of the more cautious riders but this time I just felt it and attacked and was really able to make up ground. It was disappointing to drop back at the end but I started losing entry grip so just couldn't hold on to third. In race two I actually started with some worry because I seemed to be the only one starting on a wet patch. I knew turn one was wet but I actually got one of the best starts I've had all year. I was really pushing and held second for a long time - the pace was fast and I was able to hold on. I wanted so badly to get back on the podium for me and the team after everything, but unfortunately turn one caught me out. I ran a little wide but I really didn't expect it - I hit a damp patch and just lost the front. I didn't want the weekend to end like this, but I'm taking the positives from it into Assen, which is a track I really like and I think can be good for us to bring some good results to the end of this season. I enjoy racing here and especially when you've had success at a venue before you come back with great memories, and I was feeling positive especially after making a step in race three at Silverstone. Unfortunately we just haven't found that good feeling here this weekend. The pace and the results just weren't there, and I'm dismayed to be honest. I know this place well but we just haven't been able to pick it back up this weekend. I expected more of race one in the wet, and in race two we just didn't have the pace to stay with the group which was frustrating and not where we need to be. It'll eat at me all week, but at some point we need to move our focus to Assen. We've got five races left this season, and we need to work hard to try and finish it with some trophies. It's been a tough weekend here at Oulton this time, and comes off the back of missing out on the Showdown. The mixed conditions throughout the weekend have made it hard for us to find a rhythm. We had a few issues in free practice and qualifying for Jason, but he tried really hard in both races with great starts. He got a bit duffed up at the end of race one and finished just off the podium, and was really pushing hard in race two at the front until unfortunately he lost the front end. With Dan really we've just struggled to get him on the pace all weekend, so it's been disappointing. Current time: 24-04-2019, 12:00 AM Powered By MyBB, © 2002-2019 MyBB Group.